Wander through the salons, bedrooms, halls and landings of this hilltop former royal residence to see exhibits of historical artifacts. The 18th-century Chapultepec Castle sits on the highest spot of Polanco, a hill once sacred to the Aztecs. This opulent former home of Mexican royalty now hosts the National Museum of History, a treasure trove of important artifacts, including the belongings of former rulers. Start by wandering through exhibition halls that display historical items and artworks. These cover the period between the 16th-century Spanish conquest of Mexico and the Mexican Revolution that started in 1910. Many exhibitions are temporary, drawn from the museum’s own collections and those of other museums. Among the items you may see are furniture from the 16th and 17th centuries, commemorative medals, historical documents and centuries-old swords, cannons and other weapons of war. Head to the exhibition area known as the Alcázar. Browse paintings, furniture and other items that belonged to Emperor Maximilian I and his wife Carlota and to President Porfirio Díaz and his wife Carmen Romero Rubio. While on the first floor, visit the smoking room where the emperor and his guests discussed issues of the day after dinner. In the Salon of the Goblins, view portraits of the emperor and his wife and of Napoleon III and his wife Eugenia de Montijo. See Maximilian's brass bed in Carlota’s bedroom. 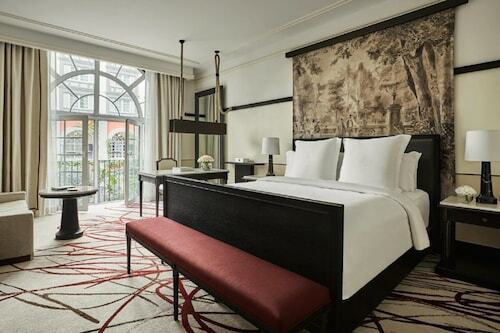 Go up to the second floor to explore its rooms, including the Salon of the Ambassadors, decorated in French style. Leave the castle for a walk around the grounds, passing statues, water features and manicured flowerbeds. The castle and museum are located in the first section of Chapultepec Forest, a city park. Arrive by public transportation or drive. There are no parking facilities at the castle, but you can pay to park in one of the lots available at the nearby Museum of Anthropology, the Museum Tamayo and the Museum of Modern Art. Chapultepec Castle is open every day except Monday. Admission charges apply, with discounts for senior citizens, people with disabilities and children under the age of 13. Visit on Sunday and take advantage of free general admission. Afterward, enjoy a walk through the park's forests and past its lakes and monuments. Chapultepec Castle & Anthropology Museum is one of the most popular activities available for purchase here. For more things to do, have a look at our Polanco things to do page. 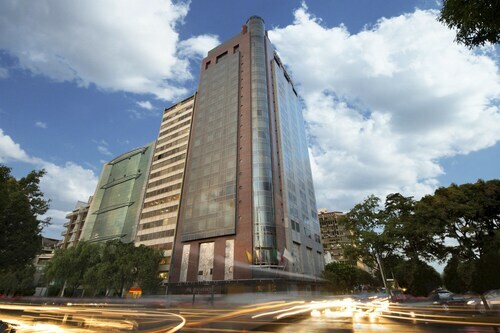 Amid numerous restaurants and shops, the mid-rise Galeria Plaza Reforma is in the Zona Rosa district, 1 block from the grand boulevard Paseo de la Reforma, which leads to Chapultepec Park. In one of Mexico City's finest neighborhoods, the Fiesta Americana Grand Chapultepec is across the street from Chapultepec Forest Park. 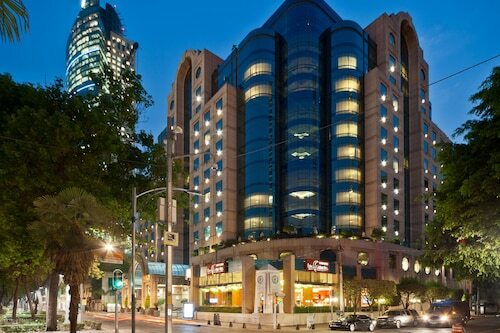 The hotel is close to the main attractions including the Auditorio Nacional, Torre Mayor, Corporativo Carso, Museo de Antropología, Castillo de Chapultepec and the city zoo. 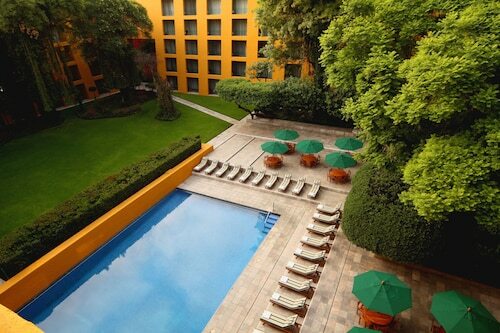 Located in Polanco, this spa hotel is within a 10-minute walk of Avenida Presidente Masaryk and Chapultepec Park. Auditorio Nacional and Antara Polanco are also within 1 mi (2 km). Polanco Station is 9 minutes by foot and Auditorio Station is 20 minutes. Located in Reforma, this hotel is within a 10-minute walk of Chapultepec Park, Paseo de la Reforma, and Avenida Presidente Masaryk. Museo Nacional de Antropologia and Diana the Huntress Fountain are also within 15 minutes. Chapultepec Station is 18 minutes by foot and Sevilla Station is 18 minutes. Located in Polanco, this property is steps from Monumento a los Ninos Heroes and Chapultepec Park. Paseo de la Reforma and Castillo de Chapultepec are also within 10 minutes. Chapultepec Station is 11 minutes by foot and Juanacatlan Station is 16 minutes.